The festive season has already begun and it’s time to plan for your Diwali gift idea list while preparing for the grand festival of lights. If you are looking for Diwali gifts price under 300, shopping it from the online gift store of FlowerAura could be the best option for you. So don't wait and choose our selected Diwali Gifts below 300. Diwali is probably the most celebrated festival in India which spreads a vibe of happiness and laughter everywhere. Also known as the festival of lights, Diwali signifies the triumph of good over evil, light over darkness, and positiveness over negativeness. Therefore, celebrating Diwali with utmost fervor is believed to enlighten the lives of people. On Deepavali, people wear new clothes, eats festive food, light up Diwali candles or Diwali clay lamps, burn crackers, and seek the blessings of Gods. But, most importantly, people exchange Diwali gifts with their family, friends, and loved ones. Therefore, to make your Diwali celebrations more memorable, FlowerAura brings you Diwali gifts online shopping at your fingertips. Yes, now you can buy Diwali gifts online from our website comfortably seated at your home. 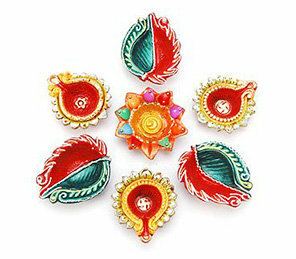 We offer you a wide variety of meaningful Diwali gifts available at an affordable price. So, you don’t have to worry about your budget now as you can pick the best gift for Diwali under 300 from us. Be it auspicious pooja accessories or authentic Indian sweets or sparkling Diwali Diyas or candles or colorful lighting or dry fruits or other gifts, our stores offer you all a beautiful range of Diwali gifts that are sure to uplift the spirit of your occasion. Now, you don’t have to go to the market and shop for your Diwali sweets amid a huge crowd. Instead of it you can sit at your home and avail our Diwali sweets online delivery. All you need to do is select the item you want to order, add your address details, and do the payment. Once your order gets confirmed with us, our delivery team will deliver your ordered gifts at your doorstep on the same day itself. This festive season, express your affection for your loved ones with our exclusive collection of Diwali gifts below 300. Yes, whether you want to buy gifts for your loved ones or your employees, now you won’t run out of money as our range of handpicked Diwali gifts are pretty reasonable. And, guess what? Now, you can also send affordable Diwali gifts that are below 300 to your loved ones and express your deepest emotions in the most beautiful way. For example, you can send delicious chocolates for Diwali to your loved ones across India. You can opt for Diwali gifts delivery in Delhi, Mumbai, Chennai, Bangalore, Pune, Patna, Nagpur, Gurgaon, and many other places. FlowerAura ensures express delivery of gifts in more than 200+ cities of India. Our delivery services include same day delivery wherein the ordered gifts are delivered to the recipient’s doorstep just within a few hours. We also provide midnight delivery through which you can surprise your loved ones by sending a gift to their doorstep at midnight. In case, you cannot receive your orders on the same day or at midnight, you can opt for our next day delivery service too. Along with our prompt online gift delivery services, we also ensure free shipping to our customers. So, go ahead to make your Diwali celebrations happier and brighter with FlowerAura’s affordable range of Diwali gifts and online delivery services.